The Memphis Sounds were eliminated by the Colonels and would be the last meaningful game that the franchise would play. Although the 1974 – 1975 season saw the highest attendance figures during the team’s stay in Memphis, both Wilson and Hayes were having financial troubles that required them to sell their shares. 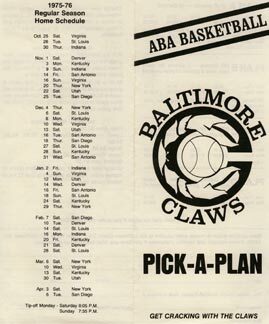 After the 1974 – 1975 season the ABA franchise was sold to a group of businessmen in Baltimore, Maryland who used it to create a team that was first briefly known as the Baltimore Hustlers and then the Baltimore Claws. However, the team had serious financial problems and collapsed before the season started, playing only three exhibition games in its brief history. Not long after the Claws folded, the San Diego Sails and then the Utah Stars folded early in the 1975 – 1976 regular season, abruptly shrinking the league from 10 teams to 7. The failure of those franchises was a factor behind the ABA–NBA merger in the summer after the 1975 – 1976 season ended.